Nutrichoice Diabetic Friendly Ragi Cookies contain a unique combination of soluble and insoluble fibers that are reported to delay glucose absorption preventing extreme swings in blood sugar levels. Ragi has complex carbohydrates that help in the slow release of glucose in to the blood stream. Ragi is known to be a rich source of calcium. Ragi is a good source of both soluble and insoluble fiber, good for heart and digestive health. "For the first time in India we have Britannia Nutrichoice 'Diabetic Friendly' Essentials specially designed for people with diabetes. There's no longer a need to avoid snacks or go hungry while traveling or at work. Rather approach snacking in a healthy way with our Ragi Cookies. 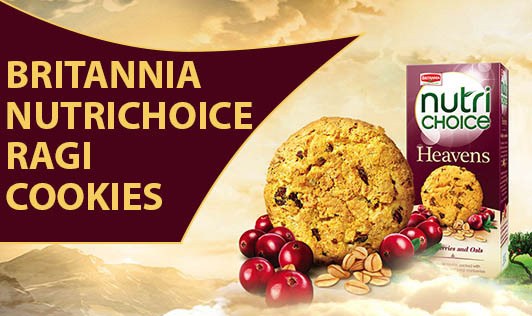 Britannia Nutrichoice Ragi Cookies are scientifically created to suit the special lifestyle and nutrition needs of diabetics to manage extreme swings in blood sugar levels. They are tasty, crunchy and convenient option for those mid-meal pangs. Ragi helps lower blood glucose levels and in a rich source of magnesium, which is instrumental for the production of important enzymes. Our Ragi Cookies are a good source of fiber, both soluble and insoluble, for heart and digestive health" is also stated. Here is the fun; cholesterol should of course be zero as it is a plant source, no point in saying "Zero cholesterol". The cookies give 5.5g of carbohydrates just for 1 single biscuit, and it says that its diabetic friendly, impossible! Extra dietary fibers: It just gives 1g fiber, which can easily be gained from vegetables. Come on! How can you call a product as diabetic friendly if it gives 38Kcals, just for 8g of biscuit and 1.4g of fat and only 1g of fiber? If the product claims "extra dietary fiber", it's just giving 1g of fiber. It should be a joke that the product is trying to make of us. The high fiber diabetic foods are readily available at home such as boiled vegetables, whole grains, leafy vegetables, fruits. Diabetes are advised for moderate carbohydrate foods and just by eating one biscuit if you get 5.5g of carbohydrates, it of course can't be diabetic friendly. And we pay Rs. 25 for 8 biscuits that are not even diabetic friendly? For what joy? You could ask why should be money the issue. The issue here is not only about money but whether the product is serving the purpose. It is just another marketing strategy that Britannia Company is using to market the product. The normal intake like whole grains, wheat, ragi, oats, barley, raw vegetables, fish, egg, fruits can give us better nutrients than the biscuit claims. So think well and do the right choice before you fall for the false claims!